Karta öfver Kongos Flod-Dal och angränsande omraden visande utsträtckningen af Kongo Fristaten af Henry M. Stanley [Map of the Congo river valley and adjacent areas showing the Congo Free State by Henry Morton Stanley]. Large antique folding map printed on two separate sheets. The map is presented as it will look when joined. Please allow an additional 3 days for the map to be joined. Title of map:'Karta öfver Kongos Flod-Dal och angränsande omraden visande utsträtckningen af Kongo Fristaten af Henry M.
The image below shows an enlarged cross section from the centre of the map to show the level of printed detail. This map is folding hence the centrefold line may show on the image below. This large map shows the Congo River basin and Great Lakes of the African Rift Valley in great detail. The borders of the Congo Free State, declared the year of publication of the map, are shown. The map is taken from the Swedish language edition of The Congo and the founding of its free state: a story of work and exploration. IMAGE SIZE: Approx 80.0 x 107.0cm, 31.25 x 42 inches (Large); Please note that this is a folding map. PROVENANCE: "Kongo den nya Fristaten I de Svartes Verldsdel" af Henry Morton Stanley, Albert Bonniers Förlag, Stockholm [The Congo and the founding of its free state]. 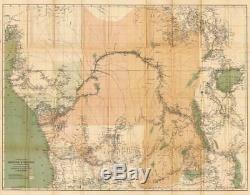 TYPE: Large antique folding map printed on two separate sheets. VERSO: There is nothing printed on the reverse side, which is plain. CONDITION: Good; suitable for framing. Virtually all antiquarian maps and prints are subject to some normal aging due to use and time which is not obtrusive unless otherwise stated. AUTHENTICITY: This is an authentic historic print, published at the date stated above. I do not offer reproductions. It is not a modern copy. The term'original' when applied to a print means that it was printed at the first or original date of publication; it does not imply that the item is unique. Print' means any image created by applying an inked block to paper or card under pressure by any method including wood engraving, steel engraving, copperplate, wood cut and lithography. REMARKS: FRANCE: Gravures et Cartes anciennes. DEUTSCHLAND: Alte Lankarten und Stadt ansichten. ITALIA: Stampe e Mappe antiche. ESPAÑA: Mapas antiquos y impresiones antiguas. The item "Congo Free State & river valley. HENRY MORTON STANLEY 1885 map" is in sale since Sunday, March 19, 2017. This item is in the category "Art\Art Prints". The seller is "richben1066" and is located in London.